Applies from Fri 12 Apr 2019, 12.01pm. Last reviewed: Sun 14 Apr 2019, 5.53pm. Applies from Fri 5 Apr 2019, 2.14pm to Sun 30 Jun 2019, 12.11pm. Last reviewed: Fri 5 Apr 2019, 2.22pm. Applies from Wed 3 Apr 2019, 9.51am to Mon 30 Sep 2019, 9.39am. Last reviewed: Mon 15 Apr 2019, 10.26am. Applies from Wed 3 Apr 2019, 9.24am to Sun 5 May 2019, 9.18am. Last reviewed: Mon 22 Apr 2019, 4.26pm. Applies from Fri 29 Mar 2019, 4.29pm to Tue 30 Apr 2019, 4.22pm. Last reviewed: Mon 22 Apr 2019, 4.27pm. Applies from Fri 15 Mar 2019, 12.16pm. Last reviewed: Mon 15 Apr 2019, 1.31pm. Applies from Fri 14 Dec 2018, 3.50pm to Fri 14 Jun 2019, 3.50pm. Last reviewed: Mon 14 Jan 2019, 12.11pm. Applies from Wed 24 Oct 2018, 3.11pm. Last reviewed: Mon 26 Nov 2018, 2.48pm. Applies from Tue 7 Aug 2018, 4.00pm to Sun 30 Jun 2019, 3.48pm. Last reviewed: Thu 18 Oct 2018, 3.21pm. Applies from Thu 29 Jun 2017, 12.48pm. Last reviewed: Thu 28 Feb 2019, 12.18pm. Applies from Fri 26 Sep 2014, 12.26pm. Last reviewed: Mon 18 Mar 2019, 4.07pm. Applies from Wed 11 Oct 2017, 1.46pm. Last reviewed: Sun 12 Nov 2017, 3.32pm. There is a fire in this park called Blackbutt Range Rd, Yerriyong. Refer to the Rural Fire Service for latest information. Do not enter any closed area or area with fire. If you see an unattended fire call Triple Zero (000). Penalties apply for non-compliance. For more information about fire safety in parks and reserves, visit the NSW National Parks fire safety page for park safety guidelines. There is a fire in this park called NPWS HR Bamarang SFAZ. Refer to the Rural Fire Service for latest information. Do not enter any closed area or area with fire. If you see an unattended fire call Triple Zero (000). Penalties apply for non-compliance. For more information about fire safety in parks and reserves, visit the NSW National Parks fire safety page for park safety guidelines. A small block of Budderoo National Park (Lot 7006 DP 1002504) is closed from Monday 25 March 2019 to Sunday 30 June 2019. NSW National Parks will be running a feral goat pest control program to protect threatened plant species on the site. The block is only accessible from Parishs Road, Upper Kangaroo River. For safety reasons, no visitors will be allowed to enter, remain or pass through this block. All other parts of Budderoo National Park remain unaffected by this work. Penalties apply for non-compliance. For more information, please call the NPWS Highlands area office on 02 4887 8244 or visit the NSW National Parks safety page for park safety guidelines. The Minnamurra Rainforest Loop walk will be partially closed due to construction work from Tuesday 19 February 2019. The walk will be closed from the second bridge to the outdoor classroom. The Falls walk will remain open. For more information, please call the Minnamurra Rainforest Visitor Centre on 02 4236 0469 or the Illawarra-Highlands area office on 02 4224 4188. The boardwalk on Falcon Crescent link track is damaged and will remain closed until Thursday 30 May 2019. There is a temporary route for walkers around the damaged infrastructure. This route may be closed for short periods during the removal and installation of a new section of boardwalk. The boardwalk was damaged by fire in August 2018. For more information, please call the NPWS Nowra office on 02 4428 6300 or visit the NSW National Parks safety page for park safety guidelines. A 1080 fox baiting program will occur from Friday 1 February 2019 to Sunday 30 June 2019 in Jervis Bay National Park. The 1080 poison (sodium fluoroacetate) will be buried baits or ejector capsules which are laid on tracks and trails. Do not touch baits or ejector devices as they contain poison. 1080 is lethal to dogs and cats, and pet owners are reminded that domestic animals are not permitted in national parks. Penalties apply for non-compliance. For further information, please call the NPWS Shoalhaven (Nowra) area office during business hours on 02 4428 6300 or visit the NSW National Parks safety page for park safety guidelines. The Carrington Falls precinct in Budderoo National Park has reopened after remedial work to repair infrastructure damaged by fire. There may be minor temporary disruptions during 2019 as work continues with some partial closures in place. This may limit access to the staircase and some sections of Carrington Falls and the loop track. Please obey any signs and barriers. Penalties apply for non-compliance. 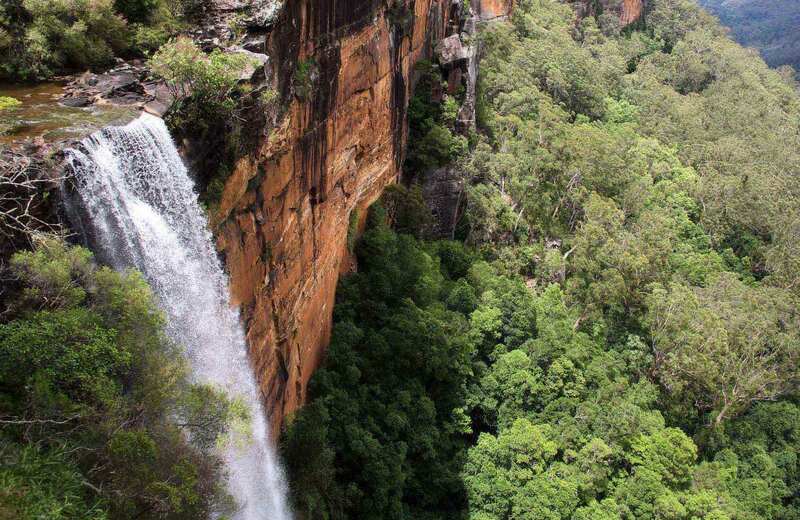 For more information, contact the Fitzroy Falls Visitor Centre on 02 4887 7270 or visit the NSW National Parks safety page for park safety guidelines. There is a 1080 fox baiting program in this park from Friday 14 December 2018 through to Friday 14 June 2019. 1080 baits are buried and above-ground ejector devices are also at bait station locations. Do not touch the bait or ejector devices. Dog owners should not allow their dogs to wander in these areas, because 1080 is poisonous to domestic pets like dogs. Beach access from Bull Hole lookout is closed due to a dangerous drop off from the path to the beach. This closure will remain in place until maintenance works are completed. Any extension will be posted as soon as possible. Penalties apply for non-compliance. For more information, contact the NPWS Nowra area office on 02 4428 6300 or visit the NSW National Parks safety page for park safety guidelines. Wattle trail is closed due to construction works in the Calymea Creek area. This closure may be extended and any extension will be posted as soon as possible. Penalties apply for non-compliance. For more information, call the NPWS Nowra area office on 02 4428 6300 or visit the NSW National Parks safety page for park safety guidelines. Penalties apply for non-compliance. For more information, please contact NPWS Nowra area office on (02) 4428 6300 or visit the NSW National Parks safety page for park safety guidelines.